Or as I like to call it See Jayne Run Half Marathon since my Big Sister's name is Jayne. We hit up the expo on Saturday night. It was a disappointment :( The space was huge but there were very few vendors and those that were there were very expensive. Also they did not have Chelsea's bib ready, hmmmm... BUMMER!! 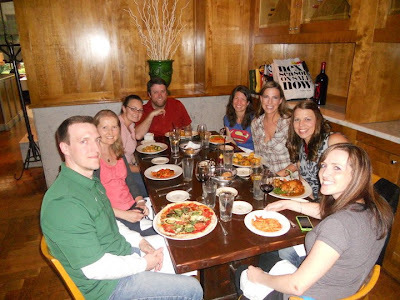 We set out to Dinner and Met Blogger Lisa and her husband in from New York for Vacation. Also in attendance Chelsea & Mike, Super Kerrie, Zoe, Jayne and me. The meals were $$ for not much food, but I was not there for the food a night with friends is the BEST regardless. We got home just after 9:00PM, Tall Sister stayed the night to make it easy in the AM. We chatted with Muscle Man, set out our gear and went to bed. Plan was to leave the house around 6:00, with awesome directions from Chelsea. PRETTY in Pink and ready to go!! The skies were a little dark, but I hoped it would burn off. I created homemade signs, I will post those soon. Her's said "See Jayne run" and mine said "See my Big Sister Jayne run her 1st half Marathon" we had signs on our front and back. Special thanks to Team Sparkle HERE for the AWESOME Pink Sparkle Skirts and to Brooks for the shoes. We hopped in the car and set out, found parking and started the WALK to the park. We met 2 girls on the way she asked if we had safety pins, OOPS they forgot to give people pins too. They were running their first half also and one girl had pink undies over her capris which read "Are we There yet?" Too funny! We came down stairs and a lady in green looked at us, at our shoes and started to laugh.. Hmmm?? I am pretty sure she was laughing at us but not sure WHY? I felt like I was back in Junior High, what the heck?? The Potty Lines were AMAZINGLY LONG!! The worst I have ever seen, we ran into Diana and she told us where the girls were. Chelsea scoped out the perfect spot for a pre-race photo or 10.. Look at this!! So nice to have my family and friends together. It was cute because Tall Sister and Chelsea were nervous and even joked about going to a bar and meeting us later. Muscle Man was our photog and race support. I truly love having my husband at my races, he is a constant supporter of my running, so having him at events makes it even more sweet. I asked him to wear a bright color so we could spot him. Fleet Feet Day glow top, success!! The full Matchy matchy look! I felt cute and loved matching with my Big sister. We set out toward the Start Line and saw Shelby HERE on the way. I love running into my Tall Friend Shelby! While near the start loads of people came up to say hi, Jen, Danielle, Janna, Laura, Meghan, and more.. It was fun chatting with everyone and posing for the race photographer. 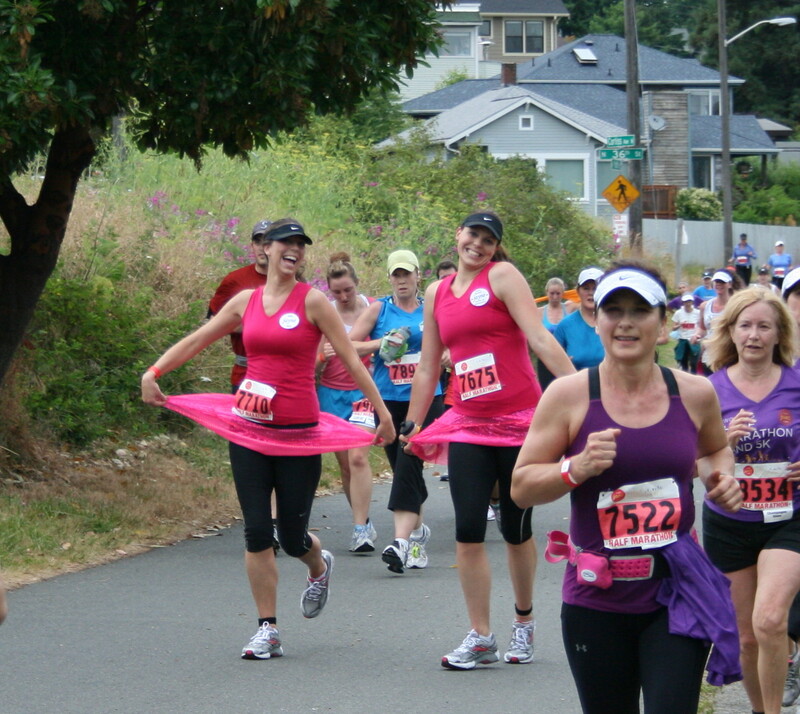 Suddenly over the loud speaker came the pre-race Jazzercise.. it was soooo funny!! People were having a blast, so we did our own version. Ninjas or Charlie's Angels?? Hmmm!! Sorry I blocked Chelsea. The start area was STRANGE! No real start chute type area with anything to show pace areas, I knew we planned to do about 11minute pace and Chelsea wanted to move back so we did..
Well not really run more like a tight flash mob shuffle. It was the WORST bottle neck I have ever seen, ladies were scrambling to hit their strides. Chelsea and I realized that this was the first time we had run together. It was brief, then I set out with Tall Sister leaving my buddy in great hands with Kerrie. This does not do the start line FRENZY justice, it was a mess...and further up the road there were out and back sections with the leaders having to run through a tight sea of women. i love this picture!! We are easy to spot for sure.. The race is a strange blur for me, I spent most of the race looking at the uneven pavement, my Garmin and checking on my sister. I also people watched, which is FUN! We saw 1/4 of a bike chained to a fence with $20 on it, I hope it doesn't sell ;) The race shirts are a rich purple, many women chose to wear the stylish tops and they looked GREAT!.. Once shirt caught my eye early on.. it read something like "Race to end Slavery in Spokane" I read it a few times... I lived in Spokane for years and do not remember having a Slavery problem.. I knew what is meant, but still made me laugh a little....If this is your shirt tell the Race director to fix the shirt, take out "in" ad a few spaces and put Spokane, WA.. Diana passed us early on and we hit the first water stop, which was FAR FOR READY.. Bummer! I liked the out and backs because I knew so many people on the course, but it was hard with the narrow paths. Our race plan was to run 5 minutes and walk 30 seconds, but with the SLOW first mile Tall Sister was not ready for a walk break. We did not walk until about 35 minutes in and that was because I did not want to waver from plan and have her fade later. I am not used to walking in races so this was a learning experience for me. Where was the walkers lane?? Answer= there wasn't one in this race. We made the most of it, I kept a close eye on the time and made sure to take care of my Sister. I knew we would see Mike and Muscle Man along the course, it was nice having them there to support us and snap some photos. Muscle Man must have looked like an official photographer because the lady in front of us was posing super CUTE!! so we copied her and kept on running. We have trained with gu Chomps so we had a Chomp break at mile 4 to pre-fuel. I also grabbed my Nathan Handheld from Muscle Man, I was a bit worried about the Water stops after the first one. I will post the pace per mile later, don't have it right now. I did not care about pace and only noticed it when the mile chimed, I forgot that Tall Sister had no idea how far we were for most of the race. She LOVED passing the mile markers, they ticked away quickly. There were so many GREAT people along the way who cheered us on, complimented our outfits and gave Tall Sister an extra boost of encouragement.. If any of you are reading this...THANK YOU!! It means so much to have a kind word and it really made her race special. We were in a section with a few different people.. It was very strange to do the walk run because we would get passed then pass them and back and forth the whole race. I have never experienced such a thing. but I know that it was what my Sister needed, the walk breaks helped her know that she could push harder while running. We hit the Lake union area near the Yacht clubs and I looked to my left the woman said "Are you Melanie?" I looked and a familiar face looked back at me, her name is Emily and we had played club volleyball together in Junior high, it was nice to see her, she looked great and ZOOMED past us. We took a walk break and ate another Watermelon Chomp. A woman introduced herself, but I cant remember her name, she had a cute tank top and infectious smile :) Around mile 7 came the HILLS. It was funny to hear people say "Hey they said it was mostly flat." HEHEHE! The course was mostly flat but these hills were lungs and booty killers. Tall Sister was fading and her breathing was labored. We slowed and took an early walk break, I was not about to push her this early on. A younger girl in a jazzercise type outfit held on to her boyfriend" whose shirt read "I am With her." There were a lot of men for an all female race?? We crossed a very tight bridge and it started to rain, just a little.. It felt refreshing and we passed a little area with paper cranes. A little boy was nearby and said "some girls run in skirts," he saw us and said "like them." It was very cute. A lot of people said "Cute tutus" and asked us where we got them. The Sparkle Skirts HERE were perfect, We wore them over our capris and did not even notice we had them on. SCORE in the cute and comfort department. They are come in loads of fun colors. Back to the race. We were chatting with ladies around us about the bikers trying to get past and the dude with no shirt running who was as a lady put it "Eye candy," I did not agree and thought he was wasting a lot of effort with his legs kicking so far up. Just ahead I noticed a woman trip, face plant and fall to the ground... OUCH!! She got right up, and dusted off, there was a metal piece on the path and we all pointed at it as we went around. there should have been a cone of something there. Around mile 9 we saw Muscle Man for the last time, he was working his way around and logged about 4 miles himself that day..
We decided that a Curtsy was the appropriated pose :) We were just a little loopy at that point. Hmm can you spot the silly sisters in a sea of focused runners?? Speaking of Focused Runners..
Up ahead was our SPEEEEEEEDY buddy Zoe who Zoomed to a PR with a smile. Congrats Zoe! Around Mile 10 I could tell that Jayne was fading, 9 miles was the furthest we had run in training and her body could feel it. We headed out for another out and back and passed pink haired lady standing near the street fair, seemed odd.. There was a mile marker sign that had duct tape on it which made it seem like it was supposed to be Mile 11, so we thought the out and back would be short. This messed with Tall Sister's head as we kept going and going. We stuck to our walk break, drank water, shook out our arms and took another chomp. We saw friends and bloggers along the way, Elizabeth said hello which was nice, I was bummed I did not get to meet her. We finally hit the turn around and passed mile 11, just 2 miles to go and I could tell the toughest part of the race was ahead of us. I tried to pull out my tricks and teach them to my Big Sister. "Try to focus on something other than yourself, look at the trees, try to read road signs, try to add up how much you think the racer in front of you spent on her outfit, people watch, sing in your head...anything to get outside of your own head, it is mental." She did great, stayed positive despite being very tired. A guy was handing out free Watemelon gu chomps, SCORE!! We each grabbed a small package. 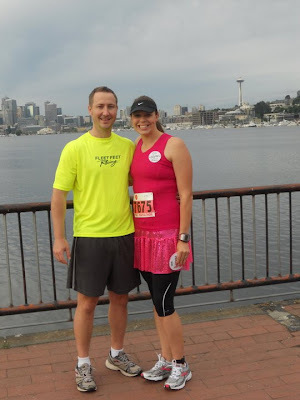 The plan had always been to run the last mile without stopping as we had done in our training runs, we approached mile 12 and I could tell she needed to walk. We took our LAST walk break and saw the Sarah and Robin shirt girls pass us. Tall Sister had taken off her visor because she got hot, I offered to carry it but she wore it on her shoulder instead. She was getting emotional and I was SO EXCITED!! Thumbs up and WELCOME TO THE CLUB!! Silly Silly Sisters!! Yes we have our Dad's sense of humor and our Mom's confidence :) I loved this last stretch and seeing the FINISH. We crossed and HUGGED! I was so proud of my Sister.. Our finish time was 2:25:25, just over 11:00 pace. At the end of the day it was not about the time on the clock it was about the journey in training, in stayhing together every step, it wearing fun matching outfits and stading Tall and confident.. SISTERS STRONG!! We got adorable little medals and headed over to get some food. I could tell that Jayne needed to eat. The cute thing was the announcers would say "Look at all these Jane's Finishing" she took it for her and wondered how many women named Ja(y)ne were running the race. Post race all I want is SALT, but alas nothing. I would have grabbed a few waters if I knew they were going to run out :( I grabbed a dry bagel and we scoped out the post race booths. This was much better than the expo. Zoe stayed out to CHEER, I visited her for a bit and found out about her PR, then went back to my Family. Tall Sister proud of her race medal and FINISH!! I am over the moon proud of her. This was Half Marathon #7 for me and my most favorite race yet. I feel so blessed to get to run with my sister and help her achieve an amazing goal. We wore matching shoes that we both LOVED!! Brooks are the BEST!! As we were taking pictures of our feet I realized I needed to watch.. Chelsea and Kerrie would be coming soon..
And there they were, pride swelled as I have coached Chelsea the last few months and know how much this meant to her. Clearly she had her game face on!! Kerrie had stayed with her every step, even the REALLY painful steps when her hip flaired up. I nearly cried when I saw them grab hands and FINISH!! Her Sweet Mike brought her flowers and we all went to talk to Chelsea.. Our eyes met and she teared up, I gave her a big hug, she was so emotional...but all good, she had done it. Two new members of the Half Marathon club. We wandered around as Zoe's lips turned blue and the rain started to pour. Then we spotted our friends from the walk to the start.. how cute are her underoos?? Funny growing up we say this to our parents ALL THE TIME!! And yes we were there, on the flip side of the months of training, sweat, blisters, fatigue and nerves... Across the finish Line. EVERY race should have champage and chocolate!! Cheers!! An AMAZING day with great friends, my amazing sister, and husband. This race had some glitches, but I know that I will be running See Jane again! What a day!!! 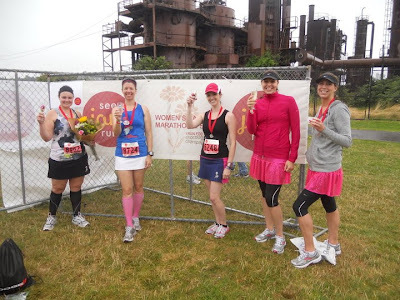 CONGRATS TO TALL SISTER, CHELSEA, ARE WE THERE YET GIRL and all of you who ran your first Half Marathon at See Jane Run Seattle!!! I will be back with post race thoughts, and some thoughts on Run/Walk racing. 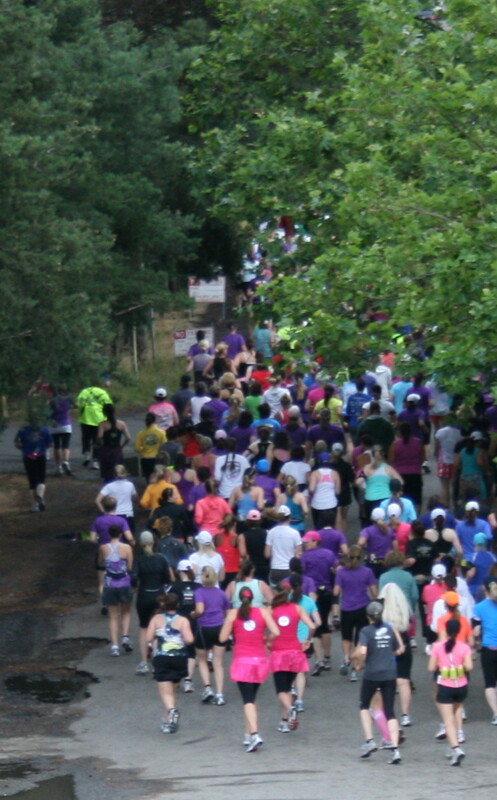 Are you thinking of running your first Half Marathon? If so, I hope this has inspired you to REGISTER and start training. Another one??! Wow! How fun! And congrats to you guys! Congrats to Jayne on completing her first half! You both looked so beautiful, it was great to meet you. Well done ladies and congrats to Big Sister on her first half. Love your outfits and the curtsies! Too cute! Congrats to Jayne on her first half and to you for being so supportive! It would be so fun to live up that way and be able to run with you guys. Great recap!! Congratulations on a great race for you both! What a wonderful experience and memory too! Congrats on a race! The outfits are amazing. I love it! Congrats to you and CONGRATS to Jayne! What an amazing thing to do with your sister. Sisters are the best. Hmm sounds like lots of not-so-good race logistics from the start, but I love how you turned it around and made it a GREAT day! How perfect to share this experience with your sister. There is nothing more rewarding than helping someone else reach their goal. Congrats to the beautiful sparkle sisters! I can't imagine the out and back for the half's. I thought it was bad on the 5K and there was less of us running the 5K. Those trails were not ment for the out and back situation. It was lovely meeting you! I am glad Tall Sister and Chelsea had GREAT first halfs! I absolutely loved reading this race recap. I got a little teary eyed reading it myself. I know exactly what it feels like to run and finish the first 13.1... amazing. I am so proud of your sis, Chelsea and others who finished their first half marathon. Way to go! I love love love that you ran the whole race with your sister. Great job out there sisters! You two look so much alike! You have the same infectious smile! Congrats on your first half Tall Sister!! Congrats!! Great race report and super cute outfits (weird that one lady was laughing)! I'm so glad that I got to see you on the course! Yay for sharing such a wonderful experience with your sister! Wow what a great and inspirational recap! 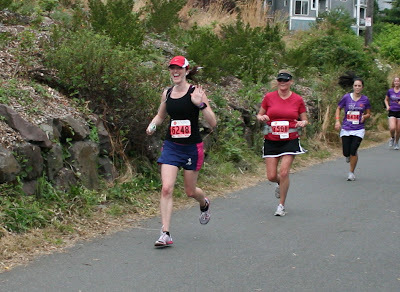 It brought back the emotions I felt when I ran my first half marathon. Congrats to you and your sister! You guys are beautiful! The outfits were so cute! 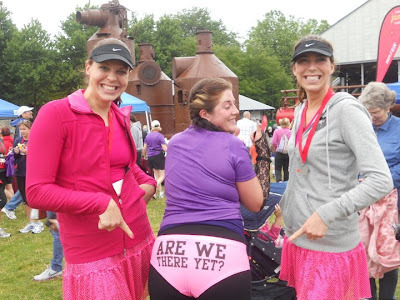 I think i will check out Team Sparkle for a skirt for Vegas RnR Half! Oh and the See Jane Run in Boise needed a few changes too. They didnt hand out saftey pins in the packets either! The course was actually perfect tho I really liked it. 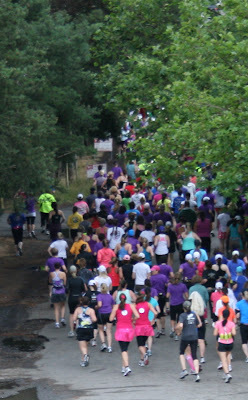 Maybe you should come run the Boise one one year :) I would love to host! Congrats to you and Tall Sister for a great 1/2! I love the skirts! Great race write-up. Setting the bar high for fun! 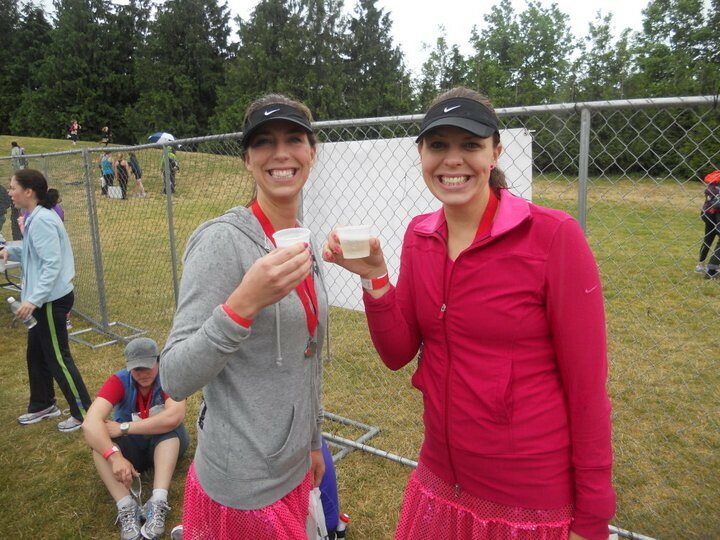 Running a race with your sister is almost as awesome as running with the hubby. 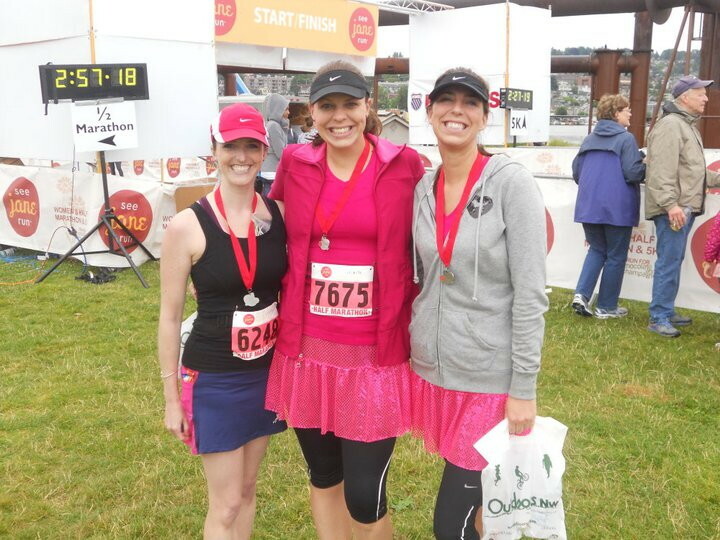 When my sisters and I ran SLC marathon in April we dressed in matchy matchy... tons o compliments. Loved it. You girlies look super cute. Wow, it looks like you both had such a great time. Congrats to you and Tall Sister. I love that you stuck with her the whole time. What an awesome race recap! Congrats to both you and your sister! This looks like a fantastic day all around Mel! You sistas look adorable and so fun to share it with friends too! Cheers!! Big Kudos to your sister - and you, too - for a fabulous run! How special to share that moment together. LOVED your recap! And, the cute pink outfits! Great photo's!! I'm signed up for my very first half in February.. the Disney Princess half. I'm so nervous since I'm a running newbie and currently recovering from Achilles Tendonitis. Tips for newbies? My husband ran with me. It was great to have him there to support me through my first half. We checked on SJR website and they said men were welcome to run but wouldn't be eligible for any awards. I was happy to see a dozen or so men supporting their beautiful women. 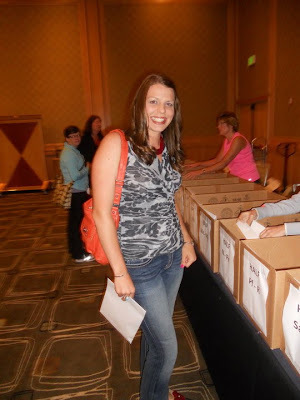 Sorry I'm so behind on blog commenting... anyhow... this post made me emotional. Love. It. 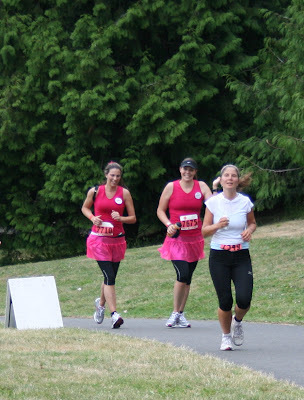 The runs where I paced people to the first half have been the most memorable... by far!